The existing levee system exacerbates flooding from Gibbons Creek, blocking it from naturally draining into the Columbia River and causing it to flood public and private property and infrastructure. The existing levee obstructs salmon and lamprey access to 960 acres of important floodplain habitat. Construct two new internal setback levees perpendicular to the Columbia River (north-south) at the same elevation as the current levee height—seven feet above the 500-year flood elevation. 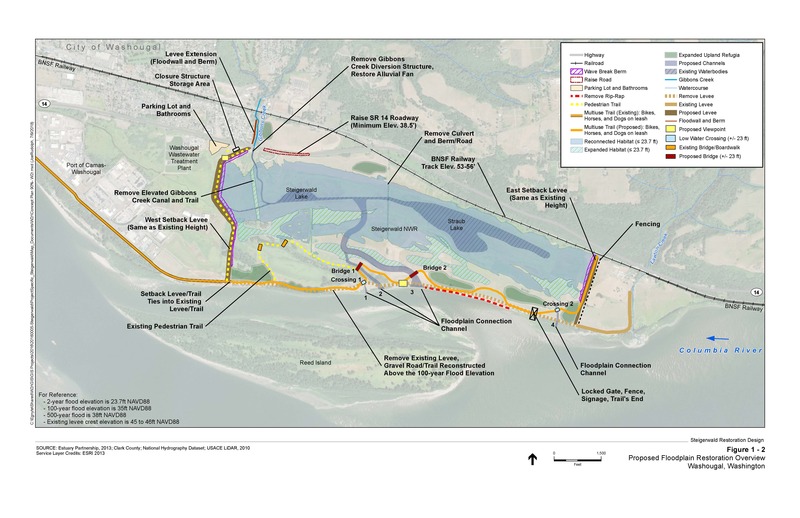 These new setback levees will protect the Port’s Industrial Park, the City of Washougal’s wastewater facility, private residences, and a working ranch. Raise the elevation of State Route 14 to the Columbia River’s 500-year flood elevation. 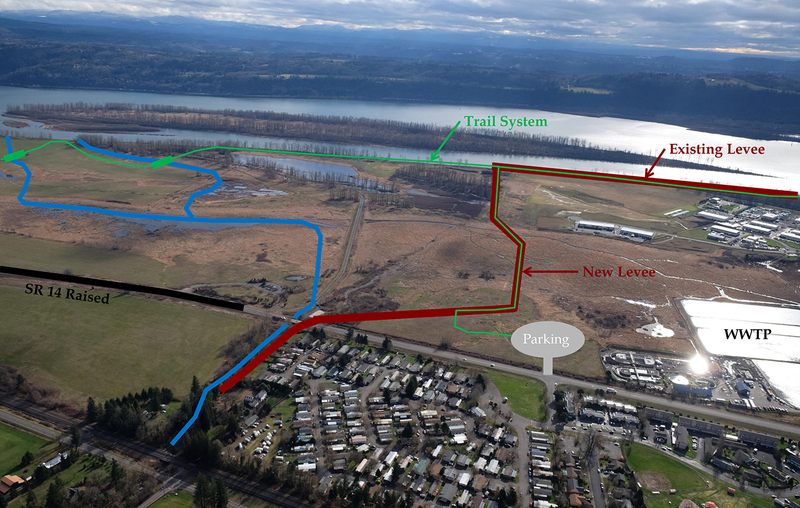 Build a new trail system and parking lot at the Refuge, adding one mile of additional trail. Remove the failing Gibbons Creek diversion, elevated channel, and fish ladder to reconnect the creek to its floodplain. 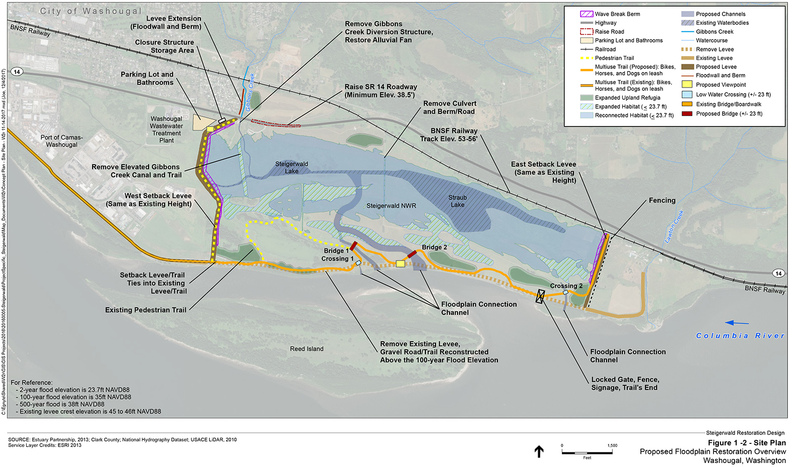 Remove 2.2 miles of the existing man-made levee to reconnect 960 acres of historic floodplain, including Gibbons Creek, to the Columbia River and improve two miles of salmon habitat. Engage hundreds of volunteers and students in plantings to enhance other floodplain habitat for a variety of native species. Restore 960 acres of historic Columbia River and Gibbons Creek floodplain habitat. Restore year-round access for salmon and lamprey to the floodplain and the entire Gibbons Creek watershed. Provide more than 10% of total credits needed to meet 2018 Federal Columbia River Power System Biological Opinion requirements in the lower River. Re-establish 200 acres of native riparian forest. 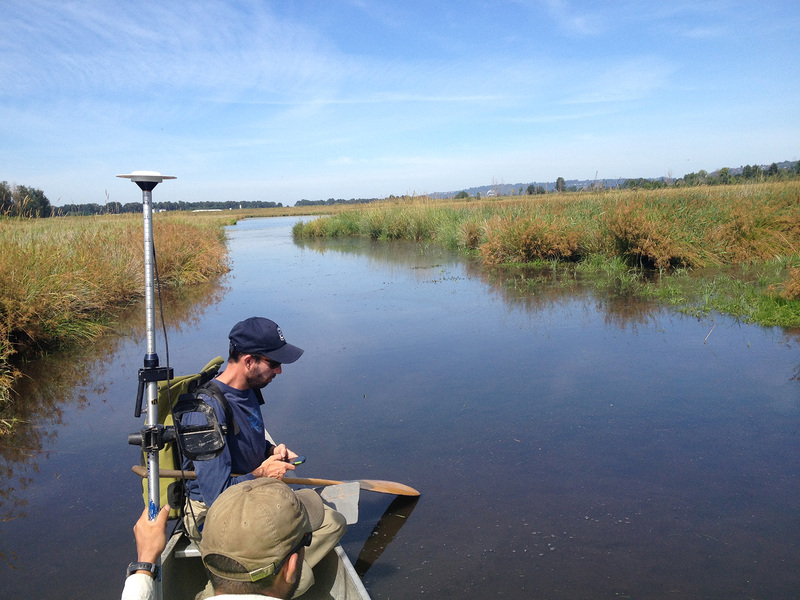 Remove appproximately 2,500 linear feet of rip-rap along the Columbia River shoreline. Significantly reduce flooding and flood risk from Gibbons Creek to upstream infrastructure, including State Route 14 and private residences that flooded in 1996. 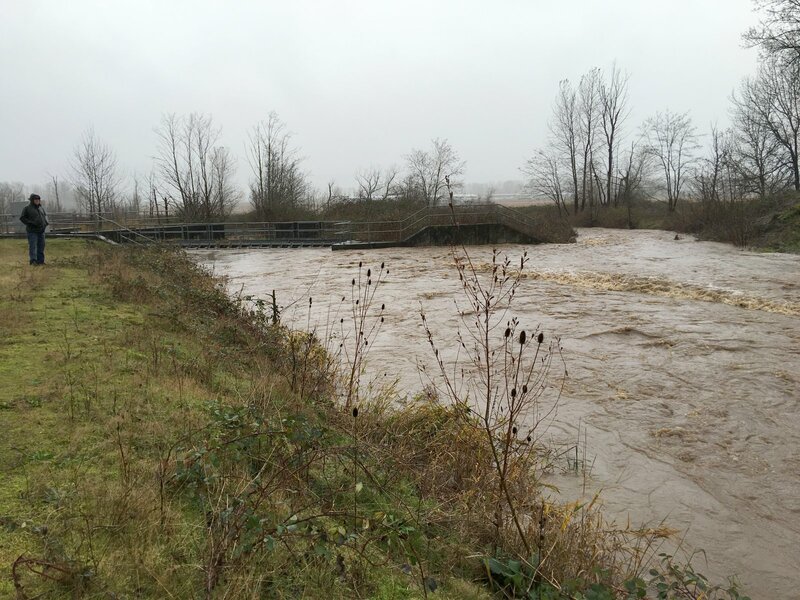 Significantly decrease Gibbons Creek flood risk to Port of Camas-Washougal and City of Washougal infrastructure. Remove 125 acres of Port and City property from the FEMA flood zone, including a wastewater treatment plant that services 15,000 residents. Reduce Port flood management costs, which averages $115,000 annually, by approximately 40%. Eliminate costs to the Port and U.S. Fish and Wildlife Service to maintain the Refuge’s diversion structure. Dredging has occured nearly every year since 1995. Eliminate the need for approximately $4 million from USFWS to replace the failing diversion structure and elevated canal. Maintain flood protection seven feet above the Columbia River’s 500-year flood elevation. Increase tourism and hiking opportunities by adding one mile of trail and diversifying the recreation experience at the Refuge. Increase public and student activity at the Refuge. The Estuary Partnership has taken over 3,200 students to the site to plant trees since 2008. This project would bring an additional 3,000 elementary and middle school student to the refuge to plant trees. Pump $22 million into the local economy; the economic multiplier of 1.9 adds another $41 million to the economy. Create and sustain over 440 family wage jobs, with an average wage of $57,000. Increase the local tourism economy by expanding recreation infrastructure. This will benefit local restaurants, shops, and other small businesses.